To see how your add-in will run in Office for iOS, you can sideload your add-in's manifest onto an iPad using iTunes, or sideload your add-in's manifest directly in Office for Mac. This action won't enable you to set breakpoints and debug your add-in's code while it's running, but you can see how it behaves and verify that the UI is usable and rendering appropriately. A Windows or Mac computer with iTunes installed. An iPad running iOS 8.2 or later with Excel for iPad installed, and a sync cable. The manifest .xml file for the add-in you want to test. A Mac running OS X v10.10 "Yosemite" or later with Office for Mac installed. 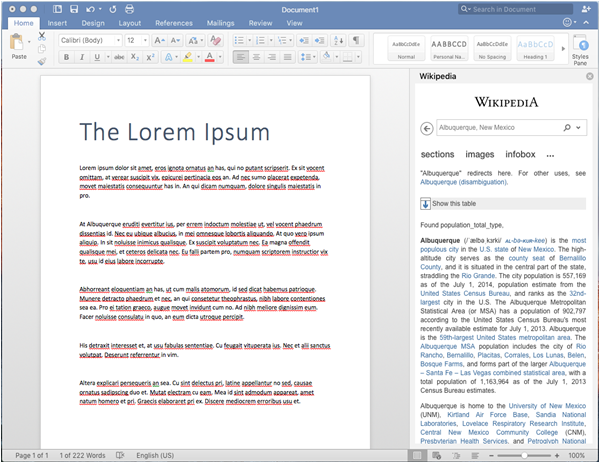 Word for Mac version 15.18 (160109). Excel for Mac version 15.19 (160206). Use a sync cable to connect your iPad to your computer. If you're connecting the iPad to your computer for the first time, you'll be prompted with Trust This Computer?. Choose Trust to continue. In iTunes, choose the iPad icon below the menu bar. Under Settings on the left side of iTunes, choose Apps. On the right side of iTunes, scroll down to File Sharing, and then choose Excel or Word in the Add-ins column. At the bottom of the Excel or Word Documents column, choose Add File, and then select the manifest .xml file of the add-in you want to sideload. 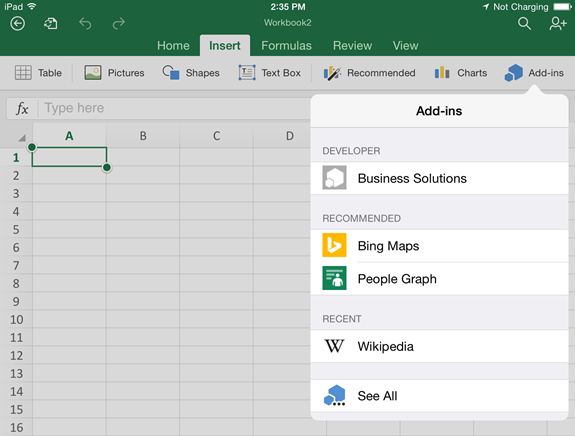 Open the Excel or Word app on your iPad. If the Excel or Word app is already running, choose the Home button, and then close and restart the app. Choose Add-ins on the Insert tab. Your sideloaded add-in is available to insert under the Developer heading in the Add-ins UI. To sideload Outlook for Mac add-in, see Sideload Outlook add-ins for testing. Open Terminal and go to one of the following folders where you'll save your add-in's manifest file. 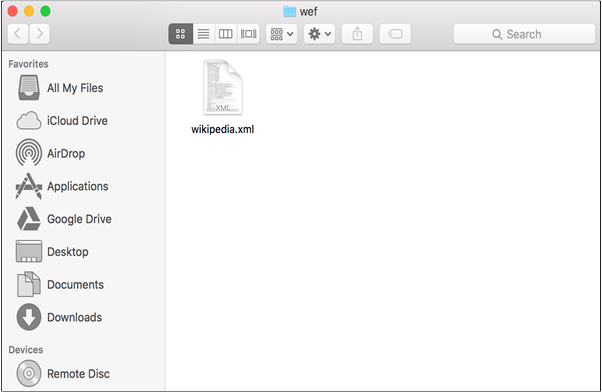 If the wef folder doesn't exist on your computer, create it. Open the folder in Finder using the command open . (including the period or dot). Copy your add-in's manifest file to this folder. Open Word, and then open a document. Restart Word if it's already running. In Word, choose Insert > Add-ins > My Add-ins (drop-down menu), and then choose your add-in. Sideloaded add-ins will not show up in the My Add-ins dialog box. They are only visible within the drop-down menu (small down-arrow to the right of My Add-ins on the Insert tab). Sideloaded add-ins are listed under the Developer Add-ins heading in this menu. Verify that your add-in is displayed in Word. Add-ins are cached often in Office for Mac, for performance reasons. If you need to force a reload of your add-in while you're developing it, you can clear the Users/<usr>/Library/Containers/com.Microsoft.OsfWebHost/Data/ folder. If that folder doesn't exist, clear the files in the com.microsoft.Office365ServiceV2/Data/Caches/com.microsoft.Office365ServiceV2/ folder.